Plate 16 from Edward Orme's '24 Views in Indostan'. This aquatint is based on a picture by Francis Swaine Ward (1736-1794). The fort at Gwalior stands on a narrow, rocky hill of sandstone which rises abruptly above the surrounding countryside. The original date of its construction is not known, however an inscription within records that a Temple of the Sun was erected in 510 and local legend asserts that it was constructed by Suraj Sen, who was cured of his leprosy by an ascetic called Gwalipa. 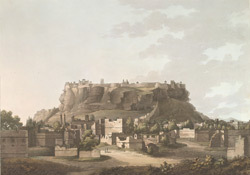 The British thought the fort at Gwalior was inpenetrable until 1779, when General Popham and his army scaled its walls and gained control of it.